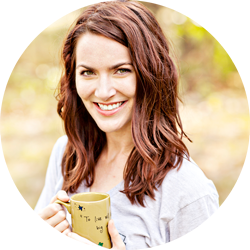 Today I get to talk about one of my favorite subjects... Coffee! You can probably tell by the name of my blog, but I really love coffee. I started drinking it my junior year of college when my roommate convinced me to give it a try (Thanks, Hanna). I think I essentially drank my cup half full of coffee and half full of vanilla creamer. Ick. At the time I felt just so... COLLEGE walking into a lecture hall with my hot cup of coffee/creamer and my huge textbooks and my layered tank top outfit circa 2005. But, I digress. I also only let myself drink coffee twice a week so I "wouldn't get addicted." I'm sure you can see where this is going... yeah, I'm addicted. And now I like my coffee strong. I cut back a lot when I was pregnant, but once Piglet was born the caffeine came back in full force. I was fortunate enough to get to try out a new coffee concept recently called "Smart Coffee." Created by specialty coffee pioneer Paul Katzeff, the Smart Coffee App allows you to choose the mouth feel, acidity and flavor notes that you prefer and then recommends a certain blend based on your preferences. You can order a bag right from the app and you can also get recommendations for blends you can make for yourself from your local grocery store. Find the app for SmartCoffee iOS or use it on your browser! It was honestly pretty fun to answer all of the questions about my coffee preferences... it made me feel like such a fancy coffee drinker :) Even if you're not super "into coffee" the app is great because it explains a lot of things about different flavors and how coffee is made and all that business. So you can impress your coffee snob friends. 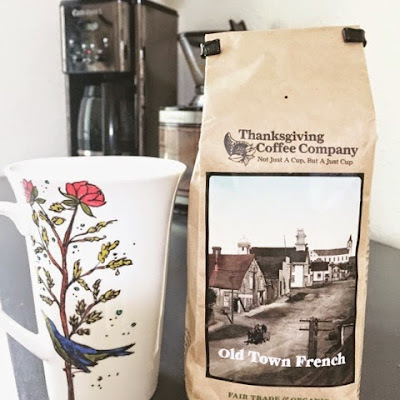 Smart Coffee has offered one of my readers a free bag of yummy coffee! Enter via the Rafflecoptor below. Because, why not? P.S. Mug from this awesome Etsy shop. I don't discriminate when it comes to coffee. My preferences usually depend on the weather--nothing's better on a rainy day then cuddling up with a hot cup of coffee... Same with a hot day, I love a good iced coffee! i try to do 1-2 cups a day or none! but i definitely drink it black!!! Ahh, coffee. I generally drink two cups a day, strong with just a little bit of cream; when I go to a coffee shop, I'll go for lattes or mochas. I like it iced and creamy! I am a total tea drinker! I have never been able to get over the bitterness. Some days I wish I did though because I could use the caffeine! I DRINK SO MUCH COFFEE!!!! This sounds SO tasty! 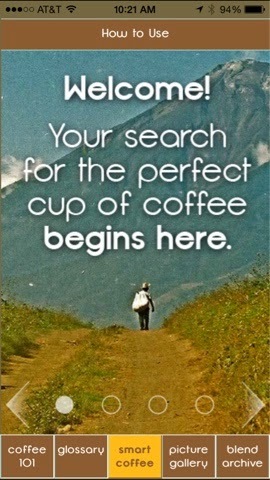 I love the flavors in my coffee- cream, flavored coffees, syrups, you name it! My current fave (if I don't make it myself) is Dunkin Donuts cookie dough iced coffee. YUM! Helps get me through the day with a 3 week old, that's for sure! I drink black coffee 99% of the time, but every now and then at home I'll add milk just to cool it down so I can drink it sooner. I used to be able to manage with just one cup of instant coffee in the morning, but lately I'm doing that and adding a full cup of real coffee. Thanks for the opportunity to win! Ok, what a perfect giveaway for your blog! This coffee sounds so fun to pick out! I drink a cup or two of coffee every morning. Since moving to Colorado, I discovered a local coffee company called DazBog. It's the best coffee and espresso I've ever had. So I grind that every morning and add a splash of Coffee Mate Classic Vanilla creamer. It has to be extra hot or it's no good haha. What a fun giveaway! Thanks Ashley! I like it with cream. I drink my coffee with a little bit of milk or half and half and not sugar. Usually drink about 3 to 4 cups per day. I'm a decaf coffee kinda girl. With lots of flavors mixed in. My husband, however, loves a strong cup of coffee just straight black. He would love this app! I hope everything is going well for you! I miss seeing your posts! I'm a coffee lover and I just can't go on a day without it! I love my coffee plain and strong. But there are days when I add sugar and cream too. 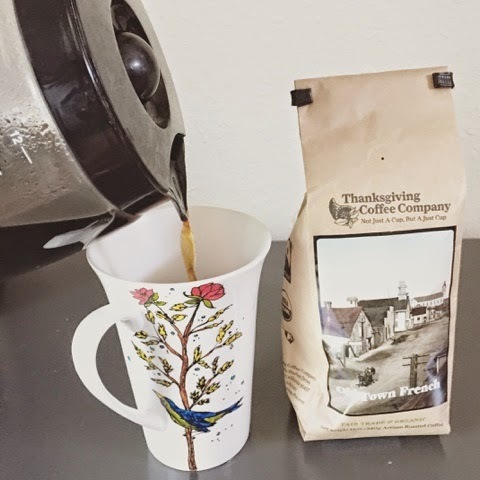 This smart coffee giveaway is fantastic! By the way, am missin' your posts!